Yu-Gi-Oh Duel Monsters Wallpaper: Yu-Gi-Oh! Minitokyo »	Yu-Gi-Oh Duel Monsters Wallpapers » Yu-Gi-Oh Duel Monsters Wallpaper: Yu-Gi-Oh! I made the background over a month ago. It's a combination of other Yu-gi-oh scans and brushes from the 5th Muse Brush Gallery. I am actually quite pleased with the background for once, it's nice to make some grunge stuff for a change. I put off adding the details to the image until today, it took me 2+ hours to add in the necessary sparkle, glow lines, and light burst lines. Icky. It could probably still use some improvement but I'm sick of it. -_- No text on this one because it seemed too crowded otherwise. Comment/criticism are welcome as always! Ooooh that's so pretty! I love how all the shiney lights are coming out of the puzzle ^_^. The Hyroglyphs (sorry not sure how to spell it) at the back also look awesome. And a very clean and great scan! Love Yu-Gi-Oh, fave from me ;). Hey that's a really cool wall. Even though I'm not a fan of Yu-gi-oh I really like what you've done with it. The background fits really well, it doesn't seem too crowd and the textures are really cool. I don't think it would have been a good idea to add text either. There aren't any place for it. And the magical effect is nicely done. I think it's well fitting, and not too overused in my opinion like I so often see in walls. Cool! This is COOL! Too cool to be true! Cool I love it! 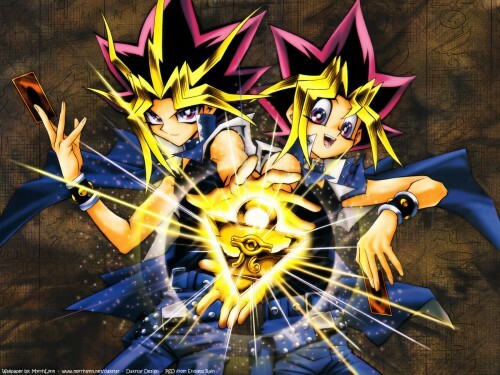 Also a big Yu-Gi-Oh fan >0< LOve it and Atem & yugi should always be together. Totally cool wallie, I have a Yugioh friend who's going to love it! It's very crisp and clean, and yeah, the background's just wonderful, very good contrast with the images without being either dull or distracting. Thank-you so much! Awesome. The colors are very vivid and the background is great! This wallpaper is very very amazing! Again the 2 YuGis , this Wallpaper is awersome, and adorable, I love both to much! they are fantastic! Thanks for upload, the background is awersome with they, nice job! Cool! Thank you for the picture! I love yugioh!,the original series is so much better than GX and 5D,they don't compare to this yugioh!great wallpaper!